One of the curses of maxing out in the upper 80s with your fastball is that no matter how many times you prove that you’re one of the best pitchers in baseball, everyone in the game will always assume you’re still one start and/or pornstache away from transforming into Jeff Pico. Such appears to be Kyle Hendricks’s lot in life. No matter how impressive his stat line looks in one season, he’ll never get the benefit of the doubt that he can carry it over into the next. It’s got to be frustrating enough to almost make him show an emotion. So it was that despite winning the 2016 ERA title (2.13) and amassing peripherals (3.24 FIP, 3.00 DRA) that suggested he really was exceedingly good at pitching, many assumed that Hendricks would regress back toward Pico-dom in 2017. Even PECOTA (3.83 ERA/3.81 FIP/4.08 DRA) thought he’d show up to Spring Training bound for a letdown season. And early on in the year, there appeared to be some genuine cause for concern. Hendricks gave up 11 earned runs in his first 15 innings on the way to a 4.18 ERA for the month of April. But it was the way he was getting hit that was even more alarming. It was as if Hendricks had decided that his fastball wasn’t named sarcastically enough. Throughout the opening month, his sinker averaged 85.71 MPH and May wasn’t much better at 86.07. Concerning his velocity, Hendricks spent the first third of the season demonstrating a good rule for fastballs and life in general: it’s probably not a good idea if it’s legal in Texas. Because Hendricks’s changeup in the early months was averaging a shade above 79 MPH, that meant there was only six to seven miles an hour worth of difference between his two most important pitches. So even when he appeared to right the ship with a 2.19 ERA for his first four starts in May, it still felt like at any moment he’d be forced into trying to trick Joey Votto with a Rowengartner-esque eephus pitch. His most frustrating start came on May 29 during the Cubs’ winless debacle of a west coast trip. Hendricks started off the day by retiring the first ten San Diego Padres with less effort than it takes to name ten San Diego Padres. But after two BABIP lucky singles and a hit batsman, he left a pitch up in the zone that Hunter Renfroe crushed for the grand slam that decided the game. After giving up four runs in four innings in his next start against St. Louis, Hendricks was finally ready to admit something was wrong. He was placed on the disabled list with a mysterious pain in his middle finger. Originally thought to be brief, the DL stint lasted for six weeks. Evidently, Hendricks had been communicating with a lot of Harvard grads. So you would assume that after that much inactivity, Hendricks would have gotten healthy and taken the mound again blazing classic 89 MPH heat, right? In two July starts, Hendricks, averaged 84.98 on the sinker. In August, it was 85.56. And as a man holding an Ivy League Economics degree, Hendricks was well qualified to tell you that those numbers are smaller than 86. Yet despite this unmistakable fact of mathematics, the performance was there. In his second start back, he gave up one run in six innings in Milwaukee. Three starts later, it was no runs in six innings against the deep Reds lineup. And over the span of his first eight starts back from the DL, Hendricks allowed a .311 OBP and a .391 SLG, good enough for a 2.31 ERA. Then came September and Hendricks finally found the velocity that had been eluding him the entire year. Our own Zack Moser broke down how slight alterations in Hendricks’s arm slot helped unlock the resurgent 86.95 MPH average on the sinker. And after pairing it with a changeup steadfastly remaining in 79.50 range, Hendricks opened the fall semester with a class for hitters called Intro to The Bench. Then came the playoffs and in Game 1 of the NLDS, all Hendricks did was allow two hits over seven shutout innings to outduel Stephen Strasburg at the top of his game in a 3-0 nearly flawless victory. 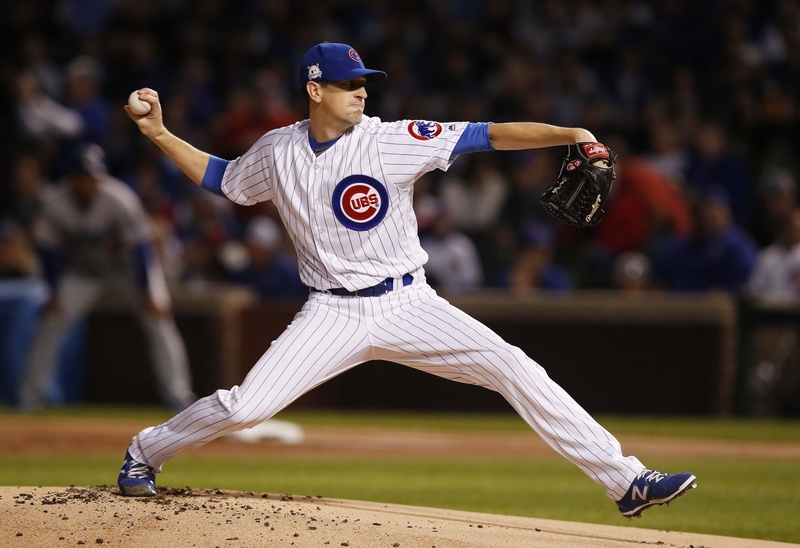 Unfortunately, just when it looked as though he was about to repeat his astounding feats from the 2016 playoffs, Hendricks stumbled in Game 5 and later in NLCS Game 3 as the Cubs were ultimately removed from the postseason against their will. Despite the ending, it was a most satisfactory year for Hendricks as he overcame his early season struggles and a lingering hand injury to find his A game and become the ace of the Cubs pitching staff. Looking Ahead: Wait, what was that last line again? With Jake Arrieta departing for free agency and Lester heading toward the inevitable regression awaiting him at the back end of his contract, the Cubs are going to rely more than ever on Hendricks to step up. And it’s clear from Lester’s quote that the most respected voice on the pitching staff is doing so as well. So how has Hendricks responded in the past when the Cubs have asked him to step his game up in an important moment? For a good example, see Game 1 of the 2017 NLDS. Or Game 6 of the 2016 NLCS. Or Game 7 of the World Series. Yeah, I think we’ll all be OK with repeating those courses.